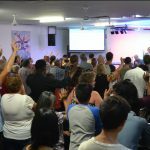 Victory Life Broome is a growing, vibrant, and relevant church, powered by the Holy Spirit. We are committed to reaching out together, in the spirit of love and unity. We see Victory Life Broome as instrumental in impacting not only Broome but the whole Kimberley region with the gospel of Jesus Christ. Services: We come together to worship the Lord in Spirit and in truth, to sit under the ministry of the anointed Word of God and to stand united in prayer. Dress: Neat and casual- we dress to honour the Lord. Parking: There is plenty of off street parking right outside the church building, with the entrance to the car park off Palmer Road. Children: If you have children (from school age to 12 years), they can participate in our Children’s ministry during each service. Children’s church starts at 10 am. Creche: Is available for Preschoolers and babies in the Creche room. For any Information regarding creche please call the church or ask before the service. We Celebrate Communion during the service. Please check our Calendar for special events.